Nervous excitement. Today is the day. Bare feet tiptoe over the hardwood floor. Sun streams through the windows. Two flags – one of the United States, one of Korea – hang centered on the wall. I’ve been here a hundred times before. But this feels different. The place is the same, but the circumstances are not. 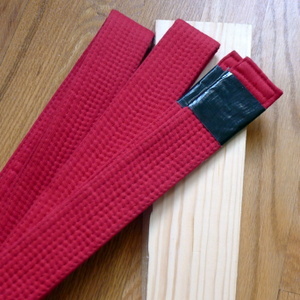 I’m going for my black stripe in Taekwondo, one level beneath black belt. Black belt always seemed so distant. Someday I’d get there, I often said to myself. But someday was about to become a whole lot closer. It would soon be one test away. Before the panel of black belts, the judges, I stand in a line with the other people testing. Sweat beads on my forehead. Eyes focus on our instructor. With a bow, the test begins. Shifting into sitting stances, we start front punches with a count. Maybe you’re changing a habit in your life – getting rid of a bad one or picking up a new one. Maybe you’re learning a skill – adding to your work or starting a side hobby. Maybe you’re building a relationship – starting from the beginning or going deeper. Maybe you’re impacting your community – helping people in poverty, growing leaders, or healing wounds. There are many ways to drive such change. But the most powerful approach I know is consistent action. Two and a half years ago, I walked into the room. My feet walked across the firm floor. A few city lights shone through the windows. Two flags – one of the United States, one of Korea – hung centered on the wall. My Taekwondo journey began. I stood on the line – a yellow strip of tape on the floor – facing my instructor. He seemed so far ahead of me. I’d never reach his level. With a bow, the class began. Our instructor introduced us to the art and we ran through a few basic techniques. The movements felt awkward and strange. Counting, we did them anyways. A project begins when you start working. A relationship begins with a conversation. A habit begins the first time you do it. The actions don’t have to be big. But they have to be actions. Thursday night. It was time to train again. But I didn’t want to go. I felt tired. Maybe I’d skip that one class. It wouldn’t matter, would it? I just could go again the next week. No one would notice. Without giving more time to my excuses, I folded my uniform, put it in my bag, and walked out the door. Reaching the gym where we practice, I entered the familiar ground. The hardwood floor, the light shining through the window, the flags – they were all there. I was there. With a bow, class began. Shifting into sitting stances, we started with front punches. My weariness faded away with each strike. Show up when you don’t want to – especially when you don’t want to. You say you’ll make it up next time, but you can’t speak for next time. And if you give in once, you’re more likely to give in again. “Could you show me that combination again?” I asked my training partner. “Sure.” She ran through the pattern again. I thought I understood what she did but struggled to replicate it. I punched when I should have blocked. My feet didn’t move as they should. I landed off balance. My attempt looked nothing like the pattern. It was terrible, and I felt frustrated. But I kept working anyways. I kept running through the steps. Be willing to mess up. You will. You’ll miss a day on your habit. Your work will be terrible. You’ll say a hurtful word to someone. You’ll pursue the wrong strategy. Change involves uncertainty. If you could do it perfectly already, then it wouldn’t be change. But don’t let those failures hold you back. Give yourself grace. Forgive others. The best way to get over failure is to learn and keep moving. The test is over. I could have done better, but you can always do better. I walk up to my judge and discuss the test with him. He tells me I did well and offers helpful advice for improving. I thank him for the feedback and return to my spot on the line. Our instructor invites us forward one by one to receive our new belts or stripes. Soon, my turn comes. Ripping two strips of black tape from the roll, he applies them one at a time to the ends of my belt. We exchange bows. I am now a black stripe. I reflect on the achievement. It’s a mark of the hard work that came before – the many hours of practice. It’s a mark of those who support me – many of them are here cheering. It’s a chance to step back from the routine. Set up marker points along the way. Celebrate what you’ve accomplished. See the habits you formed. See the skills you developed. See the relationships you built. See the community you transformed. Such moments let you appreciate the path behind you and spur you along the path before you. They also give you the chance to draw in others – to celebrate with you, to witness the change, and to become a part of it. Reaching black stripe is not the end, it is only a point along the way. Just as reaching the next anniversary is not the end of marriage, the milestone is not the destination. It’s part of a journey – a journey that keeps going. If we do not give or create allowance for change it will change us anyway. Change involves uncertainty, yes and I am thinking of balancing WHO is the instrument, WHAT is it that is intended in this particular change, WHERE is this change taking me and HOW do I go about for it to happen and also WHEN is this change required to take place. Striking a balance of these all requires wisdom and a divine one. Josephine, It’s easy to forget that fact. Change happens whether we want it to or not. Joshua, your writing for this post was spectacular. The overall story, broken up, the smaller stories, the application to life, and the poetry, made this a masterpiece for me. Plus, I know it’s one of my weaknesses. Thanks for helping me. Rex, Taekwondo is a constant source of growth for me, and I’m glad to share a little of what I learn. Be encouraged as you’ve encouraged me! Keep moving, keeping watching, learning & growing. Putting your hearty into your every moment. Bless you, let your life be complete.